Window Bird Feeders - Up Close and Personal! Click on any picture above to find out more. I used to be frightened to try this style of bird feeder simply because I was nervous that birds would fly into the window, but have found that does not happen! This is really entertaining to watch and the birds just love it. They can quickly land, grab and go, so you will see quite a few different birds arriving and leaving at any one time. I have also noticed that try as they may, squirrels don't seem to be able to use this feeder with any great success, compared to some larger window bird feeders, so this can be considered a squirrel proof feeder. I think that is because of the roof part over the reservois of food, they just can get to the feeder. 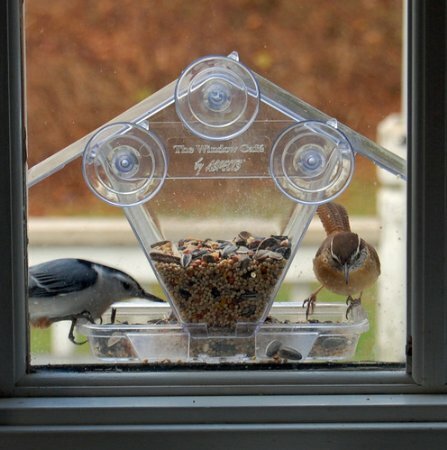 This is a window mount bird feeder and you simply dampen the suction cups and then stick it to the window. The higher up off the window sill the better so that squirrels don't try and get to it. The ultimate in bird watching right at your window!! The above panoramic in house feeder, actually sits right in your window and because it is a mirrored panel the birds can't see you but you can see them! You can see them almost in your own living room or whatever room you choose. I think this would be awesome in a dining room so that you can watch them eat while you eat. Great for the family to enjoy! Better than TV. 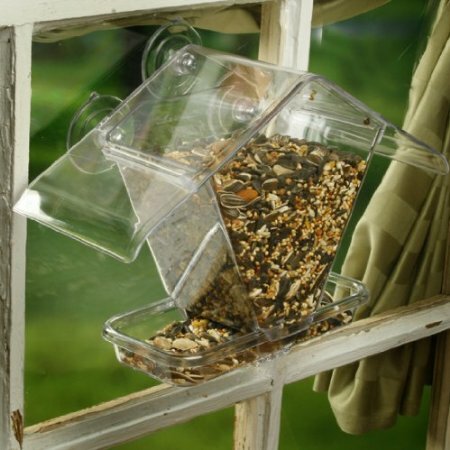 Window Bird Feeder for Small and Large Wild Birds. Birdhouse is Clear, Window Mounted, See Through, Squirrel Resistant, Easy to Install, With Drainage Holes & Beautiful Packaging. Makes a Great Gift! There are so many to choose from online. I found my local store just didn't stock enough of the these feeders, so I checked online and you can see by this page there are plenty to choose from in different price ranges. Obviously you need to be able to fill these feeders so best on main floor. But they are an awesome way to see birds up close and personal. The birds quickly find this window feeder. ​As you can see in the picture many different birds will love this feeder and if you add your very own homemade bird food they will love it even more. I use one of these window mounted bird feeders at the office and it really brings the office to life. Try one in any window that you can access from outside and where you are likely to see them, such as at morning breakfast or coffee time. 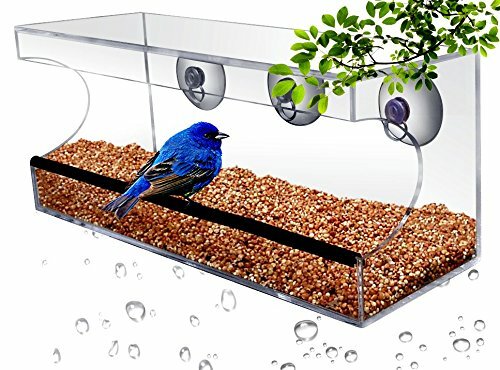 There are many different styles of these feeders but here is a very unique window feeder that will let you watch the birds feed with a one way mirror so they can't see you but you can see them.. click here to see it. It is easy to fill and clean and just makes looking out the window relaxing! Also consider getting your fine feathered friends a heated bird bath and they will stick around longer! Just click the picture or the link to find out more about this bird feeder.